NodeSource Certified Modules 2 provides you and your teams with actionable insights into the risk levels that are present in your use of third-party packages. Using a series of tests, we score packages on npm to look for a number of weighted criteria. 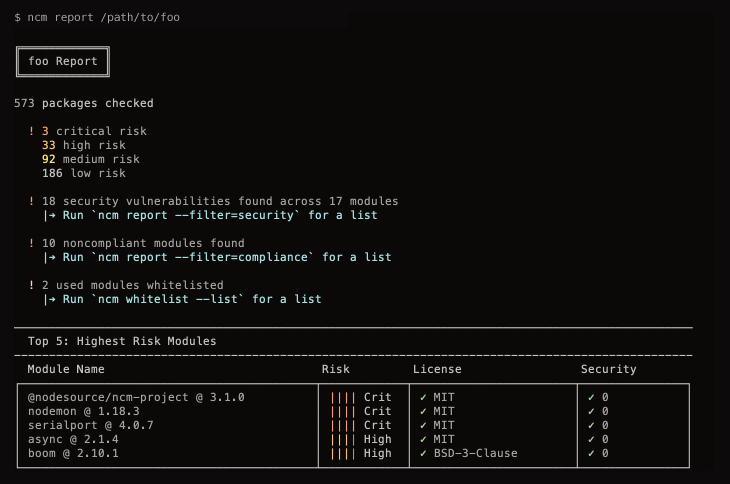 With the NCM 2 CLI you can scan your projects, for existing security vulnerabilities, license concerns, code risk and code quality. This helps you understand the level of risk exposure and how to mitigate it. 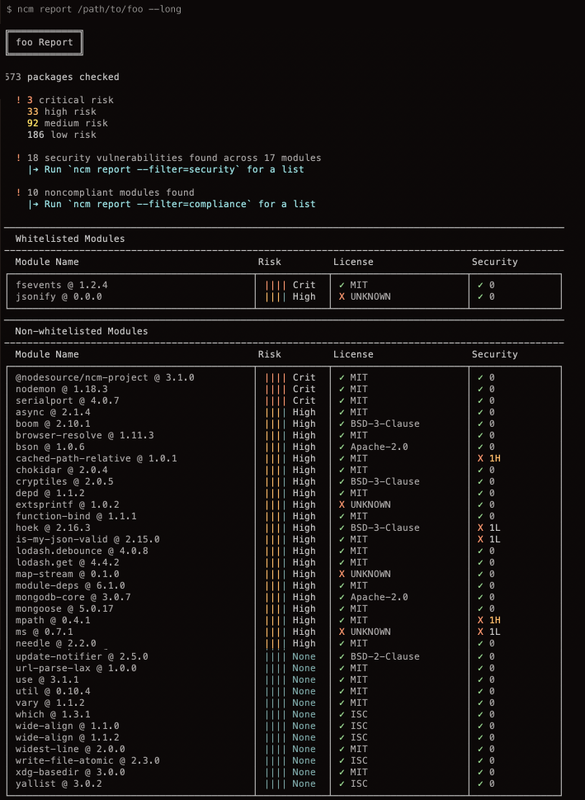 NodeSource Certified Modules 2 (NCM 2) calculates a risk score for every third party package on npm. Each module is assessed for security vulnerabilities, license concerns and a series of package risk and quality attributes. "Package": a bundled module, as distributed by npm. "Criteria": a programmatic rule run against a package. "Cert": the raw output data from a criteria. "Score": the processed, user-facing output data for a criteria. "Score Group": a set of related scores. "Severity": the approximate level of impact a score has, related to its score group. Manage acceptable risk levels incurred through third-party code. Understand current security vulnerabilities and their severity introduced via third party modules. Understand license and compliance risks introduced via third party modules. Understand potential risk vectors not yet surfaced in security vulnerabilities. Obtain insights into quality attributes that align with best-practices making your code more manageable and secure. The following paragraphs detail the NCM 2 scores, score groups, severity levels, and what all of those mean. The Security group surfaces if a certain module contains security vulnerabilities, along with their respective vulnerability-severity and if available, a path to their remediation. Security vulnerabilities as reported by Snyk. Severity output is per reported vulnerability severity. The Compliance group is for special criteria which have elevated legal and/or security implications. Any Compliance failure should be considered to have an elevated criticality, regardless of the severity level. A module with CRITICAL compliance severity should never be used. HIGH if license is invalid. MEDIUM if license is unacceptable as per the list above. The Risk group is for criteria which are intended to indicate whether a package's usage or installation may be abnormally risky, outside of purely security. Packages which include code which could have severe implications if misused. Packages which are likely to cease functioning in a future Node.js major upgrade. Packages which have poor error handling. The risk group has a more fine grained severity ranking, although severity will still vary somewhat by score. 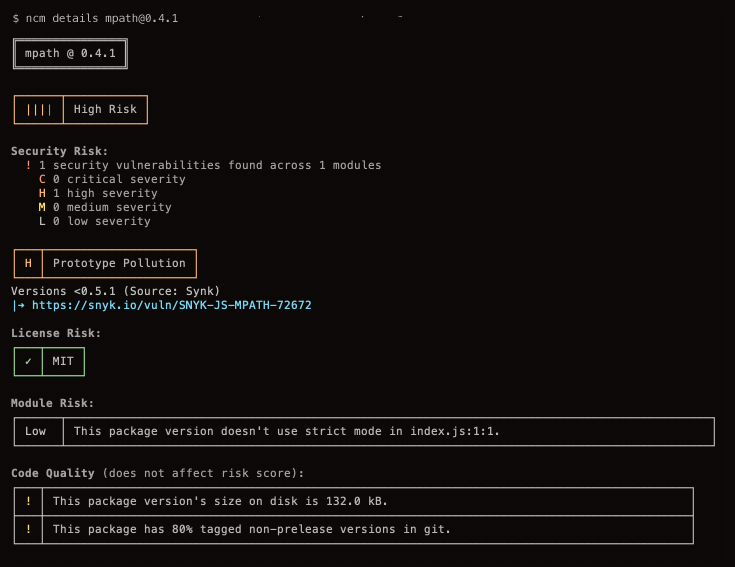 CRITICAL: Avoid install without manually inspecting this package's code & scripts. HIGH: Manually inspecting this package's code & scripts before install is recommended. MEDIUM: Inspecting this package's code before use is recommended. LOW: This package does something less-than-ideal that could manifest risk in some circumstances. This score indicates whether any npm lifecycle scripts which trigger on install were detected. Lifecycle scripts which trigger on install can be useful but are inherently risky, as they may run unwanted CLI commands before other tools or the user can inspect the package. Note: npm "scripts" are package-author-defined shell snippets which are defined in a package.json. Additionally, gyp build files from native modules are also considered install scripts under this score, as they may execute arbitrary code and also run on install. Identifying this risk attribute in a package means that its risk score will be elevated to Critical. An additional score to compliment has-install-scripts which indicates specifically the presence of a gyp build file (as required by native modules). For more about gyp files and building native addons, please see node-gyp, which is invoked by npm during the buildlifecycle step or rebuild command. This score indicates whether static code analysis of the package detected any eval() or implied eval (Function(), etc) usage. Regardless if an actual security vulnerability exists, any code that uses eval is at risk of receiving & executing unverified upstream data. Identifying this risk attribute in a package means that its risk score will be elevated to High. This score indicates whether static code analysis of the package detected any exponential-time Regular Expressions, which could be a DOS attack vector ("ReDoS") for unverified upstream data. Identifying this risk attribute in a package means that its risk score will be elevated to Medium. This score indicates whether static code analysis of the package detected any deprecated Node.js core APIs. A package which uses deprecated Node.js apis may not function in a future Node.js major version upgrade. A list of all deprecated Node.js core APIs can be found in the official Node.js documentation. This criteria may not detect all Node.js deprecations and also will not detect ones within some time of the deprecation being issued. This score indicates whether static code analysis of the package detected any callback error arguments which were not checked, where any potential runtime error may be "lost". Not doing checks & proper handling for errors in callbacks that take error parameters could cause state, memory, and/or resource, leaks. This score indicates whether static code analysis of the package detected any Promise-s which did not have some form of finalization handling. This includes .catch() or a second argument to .then(), .finally(), and most common user promise library provided handlers. Not doing proper finalization and/or error handling Promise-s could cause state, memory, and/or resource, leaks. This score indicates whether static code analysis of the package detected the lack of strict mode ('use strict') in any of the package's code. Identifying this risk attribute in a package means that its risk score will be elevated to Low. The Quality group is for criteria which are intended to indicate whether a package conforms to good open-source practices. Links to a source control repository. Quality criteria currently do not feature a severity dimension since the pipeline is intended to provide users with actionable information to help them reduce the risk-level that is present in their code. A quality criteria implies adherence to best-practices which result in more manageable and secure code. Since a quality criteria does not offset a security vulnerability or risk attribute, NCM 2 does not assign an impact severity to a quality attribute. Quality scores do therefore not affect a package’s risk level. This is determined by the lowest risk level that is present as determined by its security/ risk attributes. This score indicates whether a readme file of some sort is present. Identifying this attribute in a package means that its score will be elevated to Medium. This score indicates the size of a readme file (if a readme file is present). NONE if readme is of decent size. LOW if readme size is under 1kb. MEDIUM if readme size is under 500 bytes. NONE if package size is under 20kb. LOW if package size is over 20kb. MEDIUM if package size is over 50kb. HIGH if package size is over 100kb. CRITICAL if package size is over 1mb. This score indicates the number of files within a package. Severity MEDIUM if a package contains over 100 files, otherwise NONE. This score indicates the number of directories within a package. Severity MEDIUM if a package contains over 20 directories, otherwise NONE. This score indicates whether the package has source control information defined within its package.json. Always severity HIGH or NONE. This score indicates whether an acceptable percentage of this package's version have a corresponding tag in their source control repository (if it exists). Always severity MEDIUM or NONE. 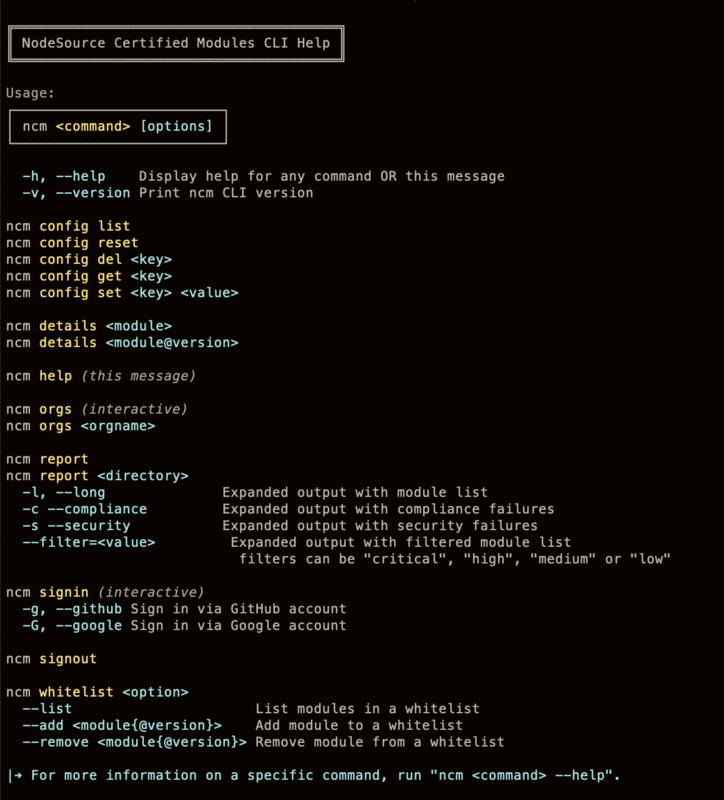 ncm-cli is a command-line tool for NodeSource Certified Modules 2.0, designed to make code quality, security, and compliance a breeze. This allows you to generate a custom project report, fetch compliance and security information, manage organizational whitelists, and inspect specific packages in greater detail -- all from the command-line. ncm-cli supports three forms of authentication. Sign-in interactively using your NodeSource account email and password. Learn more about obtaining service tokens and configuring permissions here. Generate and return a project report (defaults to the current directory) outlining package certification. To specify a directory on which to generate a report, simply pass the directory following the command. The top five riskiest modules will be displayed alongside your concise project report. By passing --long, -l, the returned report will be formatted to give greater detail into individual package certification. This will include the module name, version, risk score, license compliance, and respective security vulnerabilities. The report feature also includes the ability to filter depending on specified criteria. To display only non-compliant packages, pass the --compliance, -c flag. To display packages which contain at least one security vulnerability, pass the --security, -s flag. You may also filter the report based on one or more severity levels. ncm-cli supports the following levels of severity: critical, high, medium, low. 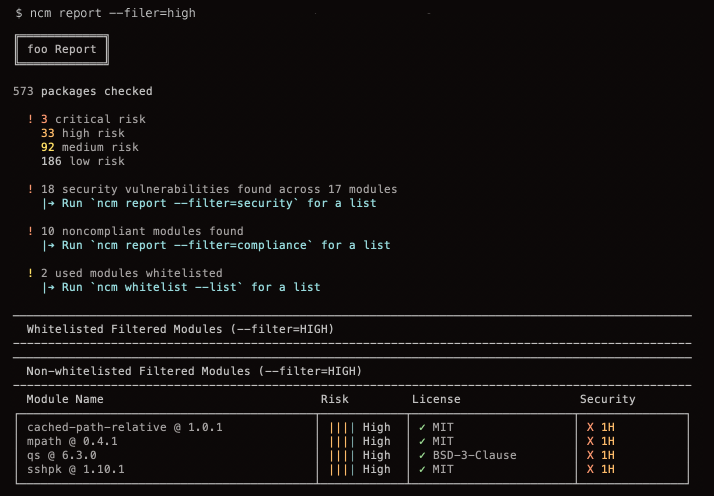 Passing the --filter= flag along with one or more of these filter parameters will result in a report that displays only packages that contain at least one such vulnerability. Returns a detailed report about a specific module with version. ncm-cli will default to using the latest version. Display and modify your organization’s module whitelist. Returns a list containing each module in your organization’s whitelist. Public modules are listed alongside their risk score, license compliance, and security summary. Add a module to your organization’s whitelist. Remove a module to your organization’s whitelist. Change your active organization interactively by entering the orgs command without passing an <orgname>. By passing an organization name, ncm-cli will switch the active organization without prompting for input. Display the NodeSource Certified Modules help menu. For more information on a specific command, run ncm <command> --help.